On March 27, 1964, at 5:36 p.m. (03:36 3/28 UTC), a great earthquake of magnitude 9.2 (moment magnitude) occurred in the Prince William Sound region of Alaska. The epicenter was about 10 km east of the mouth of College Fiord, approximately 90 km west of Valdez and 120 km east of Anchorage. The epicenter was located at Lat. 61.04N, Lon. 147.73W, at a depth of approximately 25 km. This earthquake is the second largest earthquake ever recorded in the world. after a M9.5 earthquake in Chile in 1960. The duration of rupture lasted approximately 4 minutes (240 seconds). 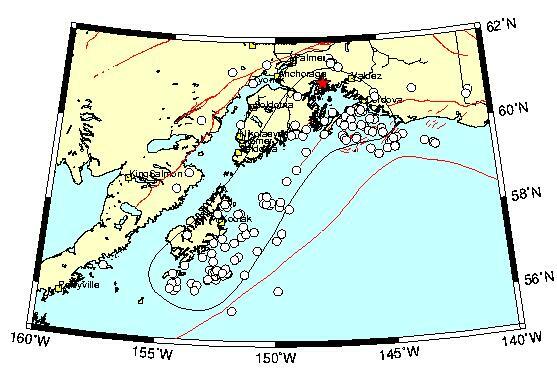 The aftershock zone of this earthquake was about 250 km wide and extended about 800 km from Prince William Sound to the southwestern end of Kodiak Island. The mainshock and its aftershocks occurred on a fault which is part of the boundary between the Pacific and North American plates. Thousands of aftershocks were recorded in the months following the mainshock. In the first day there were 11 aftershocks with magnitudes greater than 6.0; in the next three weeks there were 9 more. Smaller aftershocks continued for more than a year. n addition to damage in the epicentral region immediately following the quake, long period seismic waves traveled around the earth for several weeks. Basically the whole earth vibrated (rang) like a church bell during this time. States as far away as Texas and Florida were affected with vertical motions of up to 5 to 10 cm. Caption for map: This map shows location of the 1964 earthquake: star - epicenter, open circles - aftershocks occurred within 1 month after the mainshock, solid black line - estimated extent of the ruptured fault from the seismic waveform inversion (Christensen and Beck, PAGEOPH, 1994). Red lines are mapped faults. The area where there was significant damage covered about 130,000 square kilometers. The area in which it was felt was about 1,300,000 square kilometers (all of Alaska, parts of Canada, and south to Washington). The four minute duration of shaking triggered many landslides and avalanches. Major structural damage occurred in many of the major cities in Alaska. The damage totalled 300-400 million dollars (1964 dollars). The number of deaths from the earthquake totalled 131; 115 in Alaska and 16 in Oregon and California. The death toll was extrememly small for a quake of this magnitude due to low population density, the time of day and the fact that it was a holiday, and the type of material used to construct many buildings (wood). Much of the damage and most of the lives lost were due to the effects of water waves. These were mainly of two kinds: the tsunami of open-ocean sea wave, generated by large-scale motion of the sea floor; and the local wave, generated by underwater landslides in bays of fiords. The 1964 Alaska tsunami was the second largest ever recorded, again following only the one caused by the 1960 Chile earthquake (4 meters at Sitka). Of the 119 deaths attributable to the effects of the ocean, about one-third were due to the open-ocean tsunami: 4 at Newport Beach, Oregon; 12 at Crescent City, California; and about 21 in Alaska. Local waves claimed at least 82 lives. Maximum height reported for these waves were 70 meters in Valdez Arm. Seiches, a sort of sloshing of water back and forth in a small body of water like a boat harbor or swimming pool, were observed as far away as Louisiana where a number of fishing boats were sunk. Oscillations in the height of water in wells were reported from as far away as South Africa.